“The Heart of Rejection”- The sermon preached at the 11am Service in Dunfermline Abbey on Sunday, 31st January 2016 by Rev MaryAnn R. Rennie. Read more"The Heart of Rejection"
The Abbey is more than bricks and mortar…..it is the people that make it – literarily in this case! . 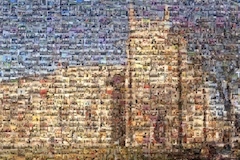 The image is made up of over 2500 pictures of the people of the Abbey taken throughout 2015. Read more"People of the Abbey"
“Ready, Willing and Able”- The sermon preached at the 11am Service in Dunfermline Abbey on Sunday, 24th January 2016 by Rev MaryAnn R. Rennie. Read more"Ready, Willing and Able"
It was another busy year at Dunfermline Abbey. Here is our review of 2015. Definitely best in full screen! Review of 2015 from Dunfermline Abbey on Vimeo. Some of those who have been married in Dunfermline Abbey were welcomed at the 11am service this morning. 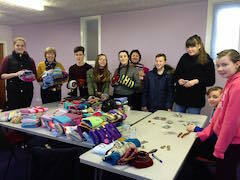 Read more"Married in the Abbey"
Busy morning for AYG, as they sort the 240 twiddlemuffs knitted by members of the congregation and count some of the coins collected for the Jar of Compassion Appeal. Read more"Busy morning for AYG"
“Wedding Etiquette”- The sermon preached at the 11am Service in Dunfermline Abbey on Sunday, 17th January 2016 by Rev MaryAnn R. Rennie. “Choppy Waters”- The sermon preached at the 11am Service in Dunfermline Abbey on Sunday, 10th January 2016 by Rev MaryAnn R. Rennie. “Bathed in Light- The sermon preached at the 10.30am Service in Dunfermline Abbey on Sunday, 3rd January 2016 by Rev MaryAnn R. Rennie.